Robert Johnson and Eddie Ornelas are not afraid of a complex challenge. They are attending courses at the UA while simultaneously developing a web solution with the potential for major impact. The application, currently with the working title of the UA Travel Project, seeks to transform registration for official university travel, making the process easier for students, faculty, and staff. “Traveling for the university has a lot of steps, and what we’re trying to do is create a smarter system designed with the users in mind,” said Johnson. “We want this experience to be quick, easy, and more importantly, backed by the institution that needs the tools in place." 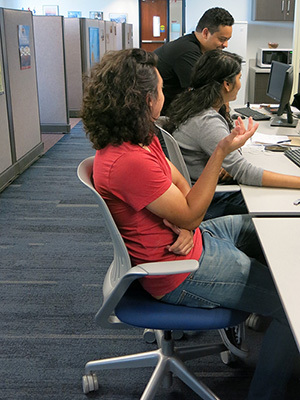 Johnson and Ornelas are student developers for Tech.Global, a 100% Engagement experience that bridges software development with intercultural competence, hence its home in the UA Office of Global Initiatives (OGI). Executive Director Ash Black guides the students as they create custom technology solutions, developing skills that are applicable to emerging technologies needed in the job market. 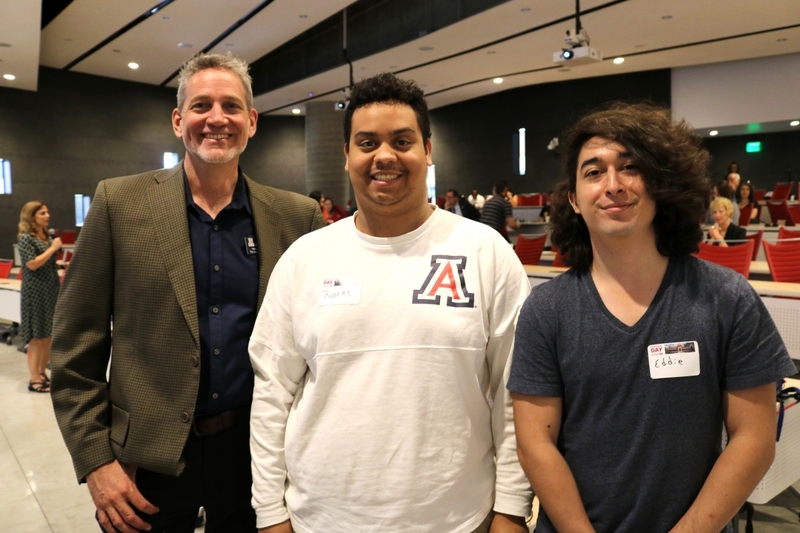 Johnson and Ornelas, with support from Black, were recently accepted into the NSF I-Corps program through Tech Launch Arizona (TLA) to test commercial viability of the travel application. TLA is the commercialization arm of the UA for inventions stemming from research and innovations developed by faculty and staff. NSF I-Corps, short for “Innovation Corps,” is a National Science Foundation (NSF) program that trains participants in customer discovery and basic business strategy. TLA is a designated NSF I-Corps site that partners with the McGuire Center for Entrepreneurship at the Eller College of Management and the James E. Rogers College of Law to give scientists and technologists a crash course in business and intellectual property concepts. “The first step is saying: who is your customer? And that’s what it really comes down to,” said Johnson. “Is this something you can sell? Is this something that can make an impact? The I-Corps program is presenting a new perspective to Ornelas, the lead developer of the UA Travel Project. The UA Travel Project was born two years ago when the team saw an opportunity to replace the current travel registry at the UA. The I-Corps program through TLA lasts three months, with the first six weeks devoted to business models and customer discovery. The Tech.Global team received $2,500 through the program for entrepreneurial education and to conduct interviews with potential customers. If an emergency were to arise, the travel application would efficiently locate UA students, faculty, and staff. “What we have learned is that the problem of managing traveler information – especially when you take into account faculty autonomy and a university ecosystem that is more like a small town – it turns out to be a lot harder than people thought. It gets complicated and it’s more complicated than industry is able to respond to,” said Black. Laura Provencher, International Risk Analyst, Global Resiliency in the Office of Global Initiatives, leads the 24/7 coverage of UA International Emergency Support (IES), which closely monitors global events and security-related trends and provides UA travelers with emergency support. Information that travelers provide in the current UA International Travel Registry is used by IES to communicate with travelers, either proactively with security-related information or to confirm well-being and offer assistance following a major security event. The current registry system was adopted as a temporary solution to fill an immediate need. Since its adoption in 2012, as Black suggested, industry has yet to develop a better solution meeting the unique needs of a large university. Provencher reached out to colleagues dedicated to international security at other campuses to explore the extent of the problem nationally and identify cross-institutional needs. Equipped with feedback from UA users and insights from colleagues, Provencher and Black forged a partnership dedicated to solving the problem for the UA with implications for also addressing the needs of other institutions. “Rather than limiting our approach to smaller and short-term fixes and improvements to fix the existing system while waiting for someone else to address our problem, the team is looking at this problem as an opportunity for a strategic solution – not only to a problem faced by the University of Arizona, but also institutions of higher education nationally and potentially internationally,” said Provencher. The Tech.Global team is currently interviewing potential users of the updated application, the UA Travel Project, starting with those in Arizona. If customer discovery proves positive, they have the option to apply for a $50,000 grant from the NSF to conduct even more interviews. Tech Launch Arizona is the office of the University of Arizona that creates social and economic impact through commercializing inventions stemming from UA research. The office builds connections between talented UA faculty, researchers and staff and experienced entrepreneurs and investors, all strategically linked to create an ecosystem that refines ideas that start in the lab and grows them into new products and thriving businesses that benefit society. For more information, visit http://techlaunch.arizona.edu.